Today we got Kasey's test results, the blood work and urine tests showed nothing really unusual except that his urine was a bit diluted (not surprising given the copious amounts of water he has been drinking). We have 5 pages of test results to present to a vet in Mexico if needed! The vet believes that he may have an inflamed bladder and Kasey is now on antibiotics. If it turned out to be kennel cough, the antibiotics should also knock it down, although he hasn't been coughing as much lately. At 2 antibiotic pills twice a day plus 2 more for allergies from the vet in Deming plus a glucosimine pill he certainly is getting lots of pills stuffed down his throat (but he doesn't complain much). The vet pronounced him good to travel, so we gassed up the truck an did some final day fixes here in Tucson, we leave for Nogales and the border crossing into Mexico tomorrow morning. 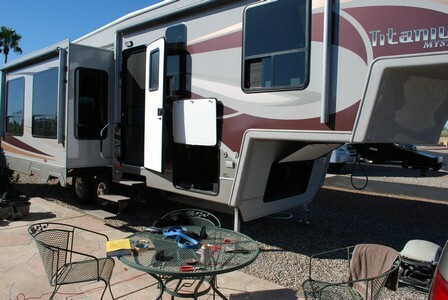 As is our custom, we will stay at Punta Vista RV park (Edger and Ana's place) in Santa Ana tomorrow evening and then head for San Carlos the day after. We may or may not erect the internet dish tomorrow, so we might not be on-line again until San Carlos. 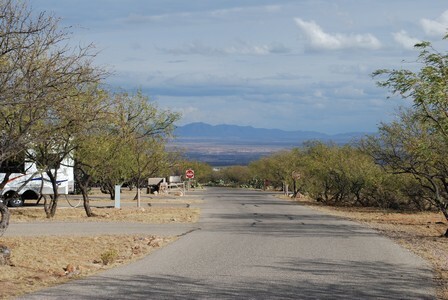 We have enjoyed or stay in Tucson, but we are eager to get to Mexico with warmer climate so Al can finally dump the shoes and socks and blue jeans, trading them for shorts and Crocs. Tonight it's going down to almost freezing in Tucson! Another shopping day with some maintenance in the afternoon. Today was bright and sunny, we spent the afternoon on the patio enjoying the good weather. Al attacked the hit list for RV and truck repair items and got 1-1/2 items done. The big accomplishment was getting the water heater to work on electricity, when the 110V connections at the water heater were looked at there was a direct connection between the hot 110V line and the green ground wire to the water heater (maybe the worker on the assembly line at Glendale was colour blind!). We won't know if this is a definitive fix until tomorrow morning when we throw on the water heater and Suzette (being the guinea pig) takes her shower. Today, it looked promising as the water stayed hot into the evening with the water heater on 110V (and the circuit breaker wasn't blowing). We also got most of the wiring done for the 12V external connectors for the UV water purification system and the external water pump, we need these for camping in Mexico. We need some crimp connectors to finish the job, there is an Ace Hardware store less than a mile away, they have these connectors, the job should be completed tomorrow. The water heater was accessed through the basement. All during the exercise Kasey supervised and gave advice! Tomorrow it's off to a GM dealer to get a part for some friends in Mexico and to continue with the "hit list" while we wait for Kasey's blood work results to come back. Today we did some shopping and we took Kasey to the vet. He got poked and prodded and X-rayed to see if there was any problem with his stomach. He had some blood taken for tests and the vet thinks he has either kennel cough or "valley fever". Not sure what that is, but apparently it's related to the dryness and dust here. We get the blood test results in about 3 days so we are hanging around Tucson until we find out. 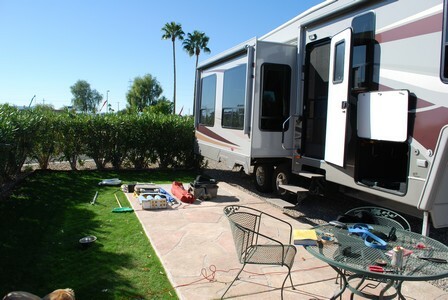 The longer stay gives some time to work on some more RV problems and get ready for Mexico. We arrived here before noon, it was a very short run from Kartchner. We decided to take off from Kartchner as it was raining and quite cool in the morning. On the way over to Tucson we ran into some heavy rain and hail, very unusual for this area. In the late afternoon here there was some rain and hail along with dark clouds and lightening, we must have brought the bad Canadian weather with us! 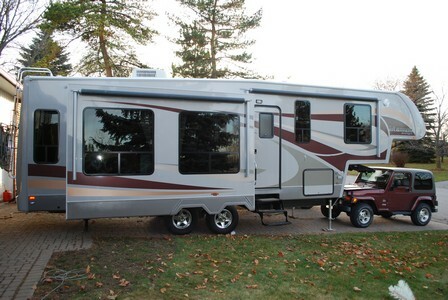 We are settled in and we will spend the few days here doing some maintenance jobs on the RV, shopping and making sure that Kasey sees a vet and gets looked after. Al has already had a couple of successes on the RV front, the wiring was changed so that DVD's can be seen on the main TV (an improperly wired connection to the DVD player was the problem), also the shelf above the DVD player was relocated higher up to allow the player to cool, so far it seems to work! That knocks off 2 of 14 repair items to be looked at, Al is starting slowly! We arrived here early this afternoon. Yesterday we had a great day, Chuck came over to our campsite and we had the first steaks on the BBQ since leaving home. We appreciated Chuck receiving some parts for us, I left an anchor for the sat dish back in Bowling Green Kentucky and a replacement was shipped to Chuck's place in Deming. Thanks Chuck! Today the anchor came in handy as it's quite breezy here, we are at about 4500 ft. altitude close to the base of a hill (see the pictures below!). The new anchor is holding the dish steady, no concerns about it blowing over. We are stopped here as we want to tour the caverns, we tried to get tour tickets for tomorrow by phone but they are already sold out. The gatekeeper indicated that there may be some available at the gate and we will ask tomorrow morning, if we don't get tickets we will head for Tucson, if we get them we are here for another night. 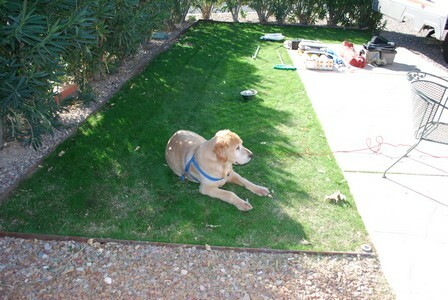 Kasey is under the weather, we had him at a vet in Deming. He has a bit of a cough, almost as if there is something in his throat although nothing comes up. The vet thought it is an allergy (not sure about that!) and gave us some medication which makes him very sleepy. He's eating and drinking (excessive amounts of water) and he's lethargic. 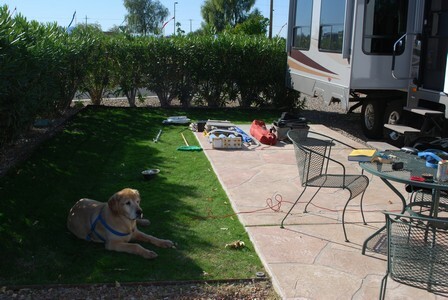 We are going to try a second vet in Tucson whe we've seen before, we need him to be on the mend before we hit Mexico. It's also worrisome that he's lost 3 or 4 pounds since he was checked in Canada although he needs to lose some weight. The hills in the background. 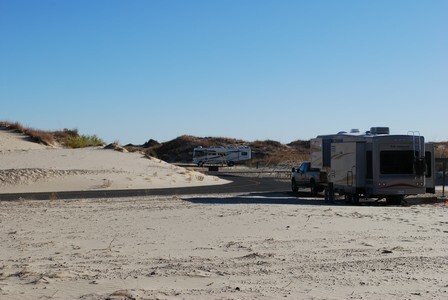 This campground is actually a bit better than Roper Lake where we normally stay, and it's closer to I-10, we plan to come back here in the spring! 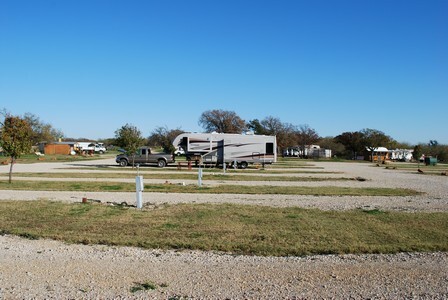 We are in the Dream Catcher RV park here in Deming, it's an Escapees park, the first time we've stayed in one. Today is the American Thanksgiving and looking at the lack of reservation sites in Rock Hound State Park we decided to stay here in town. Besides, it has full services and the folks staying here are quite friendly. We plan to stay a couple of days and visit our friend Chuck, and replenish on food, propane and diesel. It's still quite cool here overnight, at or below freezing, so the propane is being used up pretty quickly. It doesn't help that our water heater only works on propane, increasing the usage. We are still adjusting to the time change, we hit the sack earlier and get up just after six am. We will get adjusted eventually! We are back another hour in time, now we are 2 hours behind Toronto. 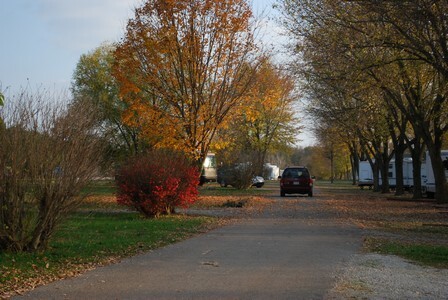 We got into the campsite before noon, and it was a good thing as the campground is starting to fill up for Thanksgiving. We went into town to do some shopping, the Albertsons lot was full of cars, it felt like pre-Christmas food shopping back in Canada. Back at camp, we met a nice couple from Midland Ontario who joined us for happy hour. 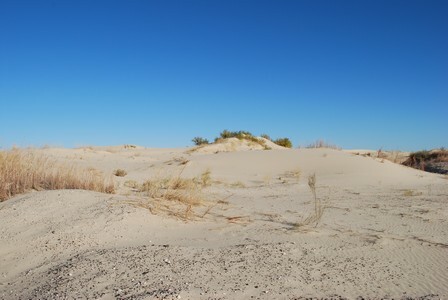 Tomorrow we take the longish trek to Deming and we hope that we can find an open campsite in Rockhound. We got here mid afternoon after a longish drive from Ranger. 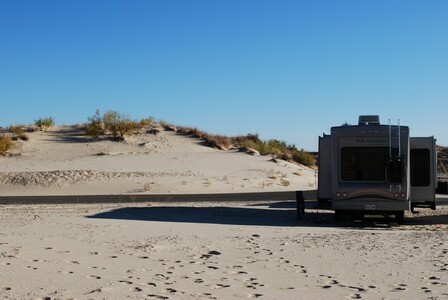 We are one of two campers in the park, a motor home set up than left?? not sure why. It was almost warm outside during the day, if the breeze wasn't blowing it was nice. The weather calls for temperatures at the freezing point tonight so we will be using propane to keep warm. Kasey had a great time with catching the ball in the sand dunes, he is sound asleep as this is being written. Lots of hills to climb! Some folks "sand boarding" in the distance. Today the truck was taken to Freddy's Garage in Ranger Texas to determine the problem with the fan belt squeaking. It turned out to be the tensioner pulley assembly which was replaced along with the serpentine belt. The total cost was just over $300 including only $72.00 of shop labour. I highly recommend this shop located in Ranger Texas, we will drop by for an oil change here in the spring. 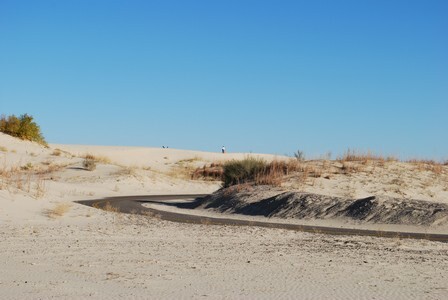 We did some shopping in the afternoon, tomorrow we make the run to Monahans Sand hills State park in west Texas. We had hoped to be in Abilene today, but we didn't make it, we are about 70 miles east of Abilene near a town called Ranger, just off I-20. We have a problem with the Ford pickup, it showed up this morning as a squeaky fan belt. The squeak has happened before but it has disappeared very shortly after start up. This time it didn't go away and the belt remained quite loose. I noted that as we traveled the battery voltage started to go down, an indication that the alternator wasn't turning because of the loose belt. 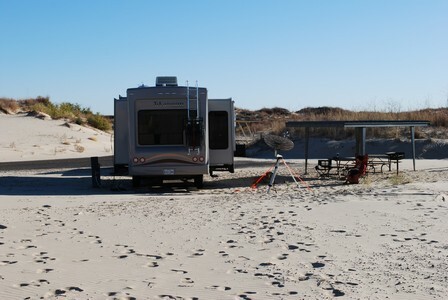 We decided to pull off here and look for a repair shop and RV park, it was a good decision! 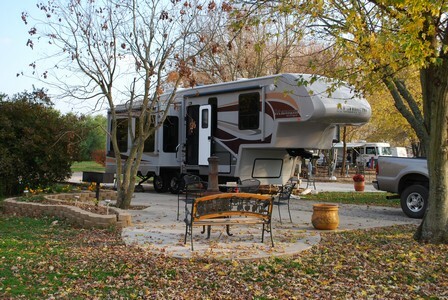 When we got into this comfortable RV park and shut off the engine it wouldn't restart (not enough power in the batteries). 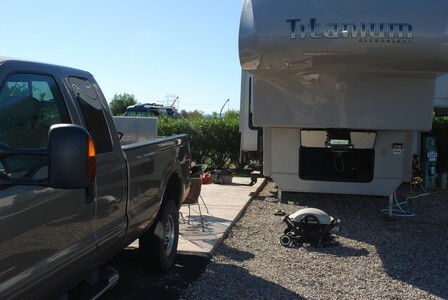 The campground owner was kind enough to lend us his battery charger and in a few hours we were able to start the truck and properly park and level the camper. He recommended a repair shop about a mile down the road (we stopped there on the way in but they were closed), that's the first stop tomorrow. 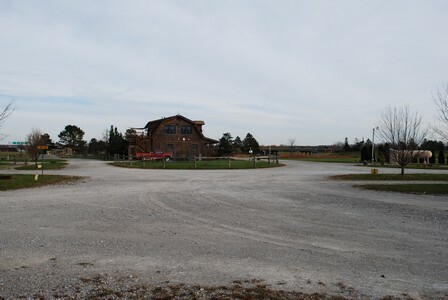 You can actually see the shop, called Freddies Garage and wrecker shop on the Google map!, the Ford dealer about 6 miles away is our alternate. We hope to be on the road on Tuesday, it all depends on the availability of a belt tensioner, which what I think the problem is. Maybe it just needs some exercising, lubrication and perhaps a new belt. Note the 80 foot pull through sites! 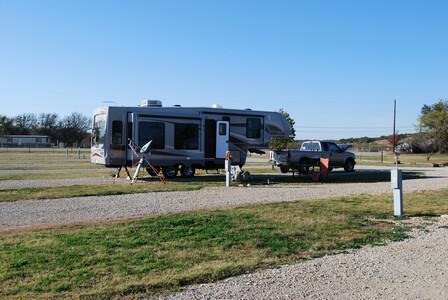 We made the trip through Dallas/Fort Worth today and we were looking to stay at Mineral Wells state park. This is the first time we've come through this area on a weekend and we were surprised to find the state park here completely full, we were directed to a park just to the east of the state park called Eagles Nest. 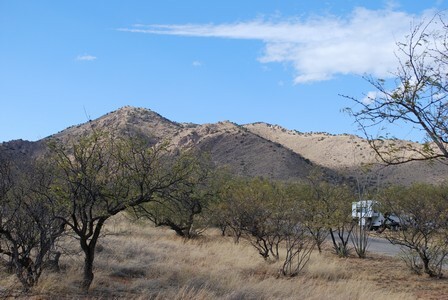 It's up on a hill, the angle of climb combined with the recent rain necessitated 4 wheel drive low range on the truck as the rear tires were spinning! I'm not sure exactly how much rain fell in the area, but some of the service roads around Dallas were closed due to flooding when we came through. 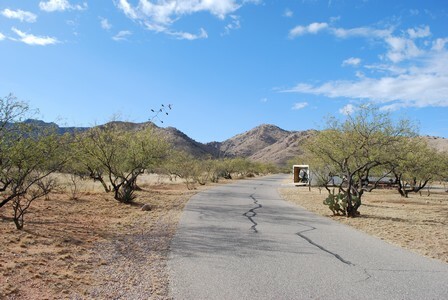 This private park is quite nice, full services and relatively large sites for $25.00 per night, the only downside is that it doesn't have a large area for Kasey to walk in, but for a one nighter it's not bad. Tomorrow it's off to Abilene! We arrived here after lunch today. Yesterday we spent the day in De Gray Lake State Park in western Arkansas, we were in the trees so we couldn't get on-line. The weather has been getting warmer, we were able to spend the afternoon outside enjoying the fall scenery, today we had a fair amount of rain so it was a bit damp. We've stayed at this site before, lots of space and a clear shot to the satellite. I checked our mileage compared to the mileage we do heading out of Ontario, it turns out that we put on about the same mileage getting to the Arkansas/Texas border from home as we put on getting to our daughter's home in Red Lake Ontario. It show how massive Canada is compared to traveling through the US. Secondly, we spent some time this afternoon looking around Mount Pleasant for a propane fill station to fill one of our 30 lb. propane cylinders (we've gone through 2 tankfuls so far on the trip). We had a cylinder filled here in town a year or two ago but we couldn't find the location (and the remark about males failing to ask for directions remains true....). It seems that virtually no vehicles down here run on propane compared to Canada where propane can be found at a number of service stations. It must be because of the lower price of gas down here. We finally found a KOA outside town that refills cylinders so we are good for a while! We got here around 1:00 pm today. 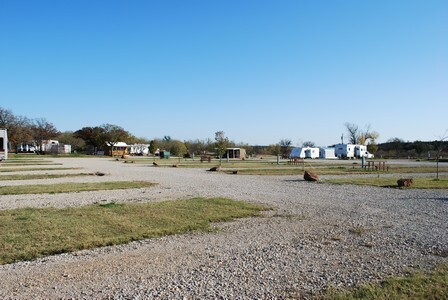 We are the only campers in the full service campground. It's a bit cool, around 45F, cold by Arkansas standards. 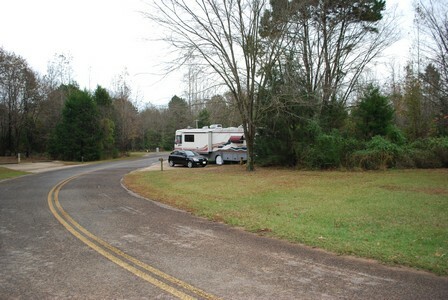 We will stay here for a couple of days to provision and relax a bit, we also want to pick up a couple of new release DVD's and do some RV maintenance. We arrived here just after one this afternoon. Up to now the weather has been great, warm and relatively sunny. Today we ran into rain just before arriving at the campsite, but not heavy enough to bother the set up. The weather is supposed to clear sometime tomorrow and be good for the rest of the week. We can't complain, it's been a lot better than what we've seen on previous trips south. We are taking the weather "downtime" to do some washing (the replacement washer/dryer works great!) and improve the web site. Tomorrow it's off to Arkansas! We got here around noon central time today from Columbus Indiana where we stayed last night. It's nice to gain an hour (we are now on central time) and enjoy the warmer weather! 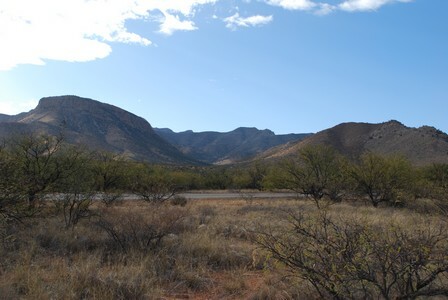 The temp hit 23C today and we haven't had any rain so far on our way south. 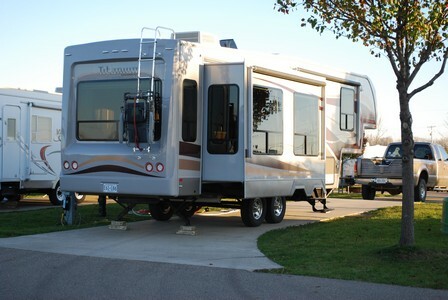 We have had a couple of quality issues with the new RV, no show stoppers but some aggravation, hopefully that is the end of the quality problems with the Titanium. All the leaves have not fallen off the trees yet! Tomorrow it's off to Tennessee! 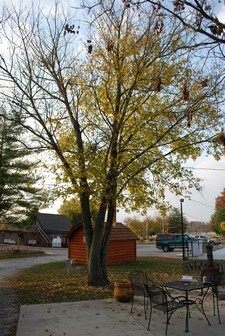 We stopped here at a former KOA campground now called the Fireside RV Resort. It was a short run from Monroe, just over 200 km., it's nice to do a short run after the longer one yesterday. We enjoyed a nice supper at a place called Shorty's roadhouse in Garrett, it's a place we like to try when we stop here. We need to get used to the larger portions (and the lower prices than in Canada!). After we returned to the RV we certainly didn't need any snacks. 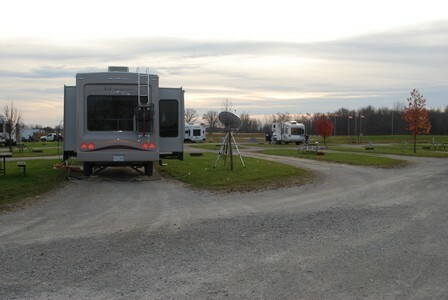 Our RV is in the foreground, another Titanium (with folks from Sault St Marie) is in the background. Tomorrow we head further south to Columbus, increasing the daily Km. number to 300+. 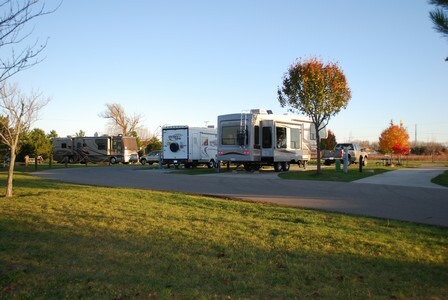 We left home this morning and made it to Monroe Michigan and Harbortown RV Resort. The run was quick, not much traffic on the road and the border crossing was smooth. One minor glitch with the RV: The electrical cord that connects the RV to the truck is a bit long, we were signaled by another driver and we stopped at a rest stop near Woodstock to discover that it was dragging on the ground. We stopped just in time, the rubber cover had worn through and a couple of copper wires were exposed. Some electrical tape fixed the problem temporarily, I'm going to cut the cable short and wire a new connector once we get to Tucson. The packing process is almost complete (except for Al's clothes!). All the systems have checked out, everything works OK except for the fresh water drain valve (it doesn't drain the tank). There isn't time to head back to the dealer and Al doesn't want to take off the lower cover to investigate, besides it might leak and make things worse. The drain isn't a showstopper as the tank can be drained by pumping the water out through the low water drain valve, but it means a trip back to the dealer for a warranty repair in the spring. The other little frustration is that the TV picture quality isn't great when the signal comes through the Wingard box to the TV on channel 3 even though the signal is from the satellite TV receiver (fully digital). The fix is to run a DVI/HDMI cable from the sat receiver to the TV directly, but there isn't time to figure out how to route the cable through the cabinet without creating a mess. 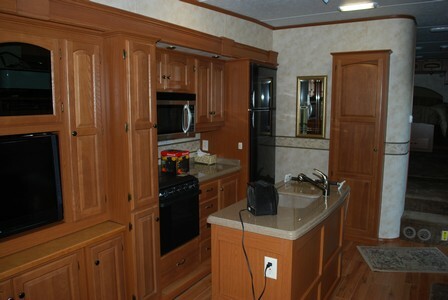 The fix will be to dangle a cable temporarily and when relaxing on the beach in Mexico (with a Corona in hand) have a detailed look at the cabinetry so it can be taken apart properly to route the cable. These are a couple of outside shots, the trailer is a light gray colour (Glendale calls it Mystique) with brown, gold and red decals. 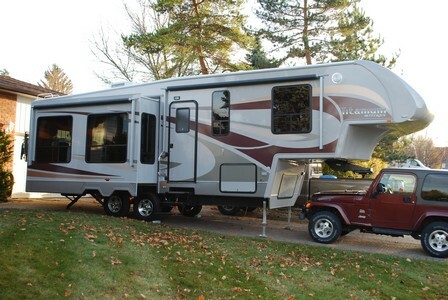 It matches Suzette's Jeep and our tow vehicle well and it shouldn't show the dirt as much as a white trailer. 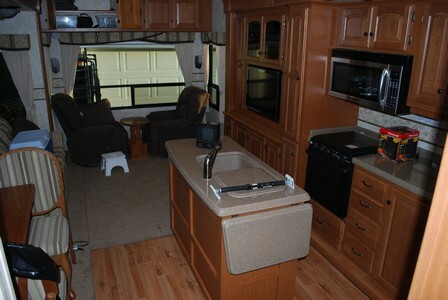 These are a couple of shots of the living/dining area with the central island that gives us some additional counter space and storage. As you can see, there is some debris hanging around from Al's work! We will finish packing tomorrow. Al discovered another reason to head south, when the hood was lifted to check the engine on the Ford, squirrels had packed about 50 pine cones in crevasses around the batteries, there are still a few to be removed! It looks to be a cold winter (at least according to the squirrels). 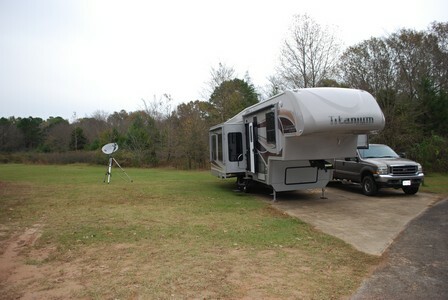 The trailer was picked up on Friday and we are checking everything out and packing. So far the check out looks good and there are a lot of new spaces to put stuff in (and lose stuff!!). Some pictures will be taken tomorrow and posted. All things being equal, we will be hitting the road for Mexico on Thursday! We are making preparations to head south again this winter to Mexico. We hope to head out during the first week of November assuming our new trailer arrives in time (we are waiting impatiently!!). We will post some pictures once the new trailer arrives!